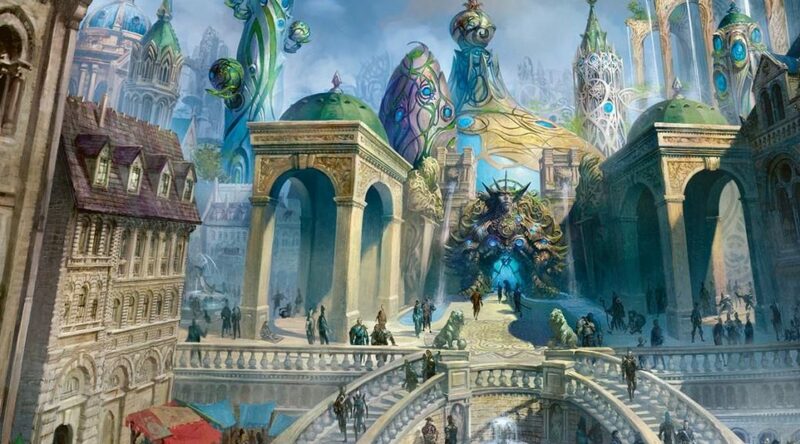 Wizards used PAX as a big jumping off point for Ravnica’s Return (or whatever), as they normally do, and we got a pile of spoilers. Shocklands are back, just in case anyone was nervous. Convoke is the only returning mechanic (making me unsure of what to do with my Chord of Callings and having very little time to decide), and there are some cool looking basics. Other than that it looks like a fairly standard Standard set so far. Oh yeah, and also, there’s a new Masterpieces set too. They’re part of a separate product which contains eight boosters and one of each of the planeswalkers. For the privilege, you’ll pay $250, only through the Hasbro Toy Shop website. You know that one that crashes every time the SDCC promos come out because it can’t handle more than forty concurrent buyers? We’ll begin by starting off this week with something I do rarely; talking about Standard cards. I know people are jazzed about the PAX spoilers though, and want to know what they mean for FNM’s favorite format. You probably didn’t see anything that made Carnage Tyrant look good, so let me explain. Saffron made what I assume was a not-entirely-serious tweet regarding one of the newly spoiled cards, Quasiduplicate. It creates a token of a creature you control (ala Cackling Counterpart) for three mana. It also has Jump-start, the new Izzet keyword. Jump-start lets cast the spell from your graveyard by paying its mana cost, exiling it, and discarding a card. He pointed out that a strong line of play will be Carnage Tyrant on turn four (after ramping twice), then Quasiduplicate into Jump-start Quasiduplicate on turn five. My suspicion is that this line of play is actually quite reasonable, and could in fact drive demand for Carnage Tyrant up significantly. Casting Tyrant on turn four means you need to ramp on turns two and three. That’s generally the play for a green ramp strategy; ramp for two turns, then start playing out nasty threats. Ramp strategies suffer a fatal flaw though. Most every card in the deck is either ramp or threat. A or B. Gas, or gas pedal. The issue lies in drawing too much gas, or too much pedal. Too much of one and not enough of the either means you’re not doing anything. And until they start printing modal spells that are either Rampant Growth or 8/8s, it will continue to be a structural problem with the strategy in general. Where Quasiduplicate, and other spell-jack cards come in is bridging that gap. Spell-jack turns your ramp into late-game utility. Those Llanowar Elves and Rampant Growths that you draw on turn seven can now actually do something for you if you’ve got a Spell-jack card floating around. Allowing your ramp spells to play double duty may smooth enough of the rough spots of Go Big strategy to be a contender in Standard. Especially with a threat as potent as Carnage Tyrant. And what will the other Spell-jack spells look like? Something that draws cards with the ability would be fantastic. A four-mana divination isn’t good in most decks, but if you’re ramping on turn one or two, you can still play it on three, and then being able to run it back on turn six or seven by pitching a Rampant Growth is going to be big game. Tyrant is a savage card, and popular to boot: he’s $15 to $17 as the 35th most popular creature in Standard. That’s awfully far down the list. Clearly there’s a lot of existing demand from casual level players keeping that price popped up. Add in any meaningful Standard relevance and we’ll see a meteoric rise. With the return of shocklands, attention will be paid anew to the Expeditions series. Several years old now, these have had time to hit the market, pop, deflate, flatline, and bleed out of inventories again. To wit: all the shocks have climbed towards $100, and Bloodstained Mire, a fetch I picked up for about $85 to $90 three or four years ago, is now about $175. Across the board, this particular tide has lifted. I went looking for an oddly under-priced shockland that I could recommend, preferably one that was 20 or 40% less than its peers. Unfortunately, there just isn’t any wiggle room. They’re all firmly at $90 or more, with no stragglers. So instead of picking out the one that’s under-priced relative to its peers, we’ll go the other direction. Assuming a relatively neutral starting position, which one is poised to jump the highest? With Teferi reigning over Standard, Azorius is going to be the tribe to beat. Even if they aren’t in the initial slate of guilds, he alone will provide enough strength that other builds will warp to include him. With both Dimir and Izzet in the first set, I suspect we’ll see Teferi splashed into one of their shells. Either way, they’re going to want Fountain for the white. If the shockland Expeditions can sit at $100 to $120 since January on Modern demand alone, they can easily push towards $200 with new and real demand. The biggest format in Magic suddenly making players care about them, now that they’re several years old, is going to drive a lot of players to consider picking them up. Even if only .001% of FNM players look into buying Expeditions, that’s still hundreds, if not thousands of players. There’s four copies on TCGPlayer right now. While I wouldn’t have predicted it, this pair has become wildly popular in EDH. They’re in 6,000 EDH decks already, despite having basically a single relevant line of text. (And one that isn’t even all that impressive, honestly.) How often are you really giving something trample? It can’t be that often, right? That doesn’t really matter all that much in EDH, unless you’ve got some infinite/infinite shenanigans going on. I don’t know, I’ve never considered trample that significant in EDH. Maybe I’m foolish. Regardless, the pair is certainly popular. And with Lord Windgrace’s arrival, they’ve only become moreso. At time of publication, we’re looking at 15 foil copies on TCG. One of which is already $10. Someone already bought out prerelease foils, so there isn’t anything left there. Why would you buy out prerelease foils and not the pack ones? I don’t know. But they did. This isn’t an unfounded play to make a $.50 foil $5 either. Pack foils have been hanging around $2 to $2.50 virtually since they were printed. Once Windgrace was printed, popularity picked up, as now there’s a legitimate tier one (popularity, not quality) EDH deck that wants a copy. In any case, Windgrace shows no sign of slowing down. That’s on par with what we would expect, too. This year’s commanders should remain quite popular at least up through Christmas or so, especially so if they’re actually good and fun, which by all accounts they appear to be. So long as this steady flow of demand from the notoriously slow-to-move EDH crowd continues, these foils are going to keep disappearing.